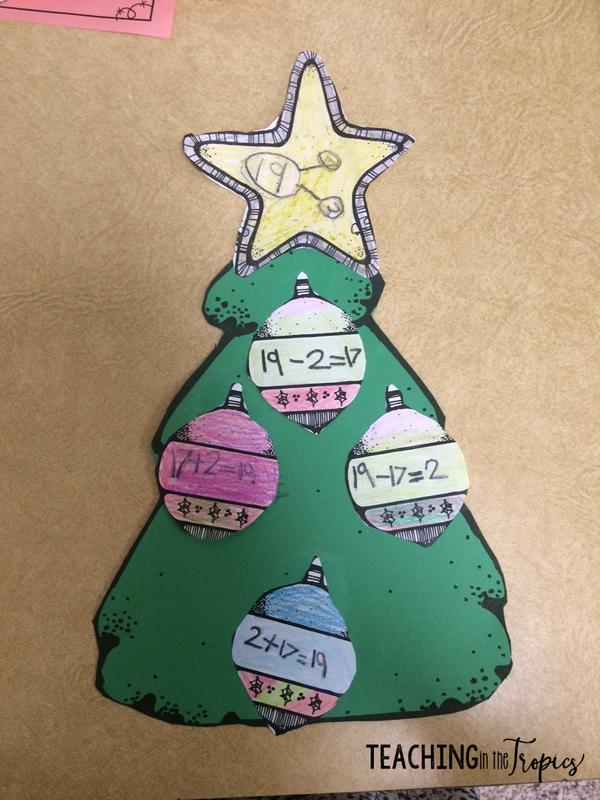 Five for Friday: More Christmas Fun! Hello again! I'm linking up with Doodle Bugs Teaching for Five for Friday to share more of the Christmas fun going on in my classroom this week. On Monday night, my island had its annual Christmas tree lighting ceremony. 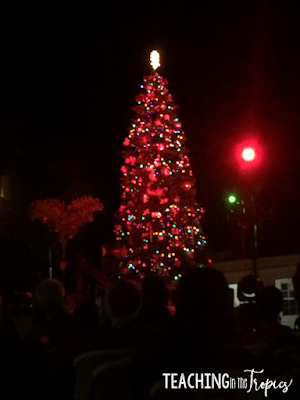 Everyone gathers at our government administration building grounds to wait for the tree to be lit and to see Santa. People from the community perform on stage as we come together to celebrate the start of the Christmas season together. This photo is terrible quality, but I wanted to have something to share on here. The tree in the photo is a fake tree; we used to have a super tall real one, but there was a major hurricane 7 years ago that destroyed it. 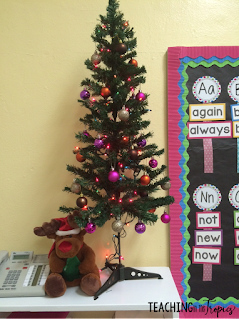 Speaking of Christmas trees, I finally put a topper on our classroom tree. It was looking a little plain at the top and I found this sparkly little bow topper at a store earlier this week. I think it definitely completes the look! Although I'm not doing elf on the shelf, I had to get it on some of the elf fun with my class this week. I recently purchased several new Christmas books to read aloud to my class this year, including The Littlest Elf by Brandi Dougherty. It was the perfect book to get my kids thinking about what they would do if they were elves. I highly recommend getting it if you don't have it! I found this adorable free elf craft on TPT from Mrs. Ricca's Kindergarten. Instead of having my students do the elf application that's included in the craft, I made an "If I were an elf..." writing prompt for them. Click here to download it for yourself! We also made First Grade Blue Skies' adorable ornament craft for our window display and Linda Kamp's "I Shine When I'm Kind" Christmas light craftivity. I love how festive they look outside our classroom! On the inside, they wrote about how they can be kind. They did an awesome job and the kids who pass by our classroom have really enjoyed reading all of their responses! (I got this craft up kind of late, but that's probably for the best. Colored paper fades super fast in the sun, so I'm sure it would already be faded out if we had done it two weeks ago.) It was a really easy and meaningful craftivity though and I will definitely be repeating it every year as we talk about kindness at Christmastime. 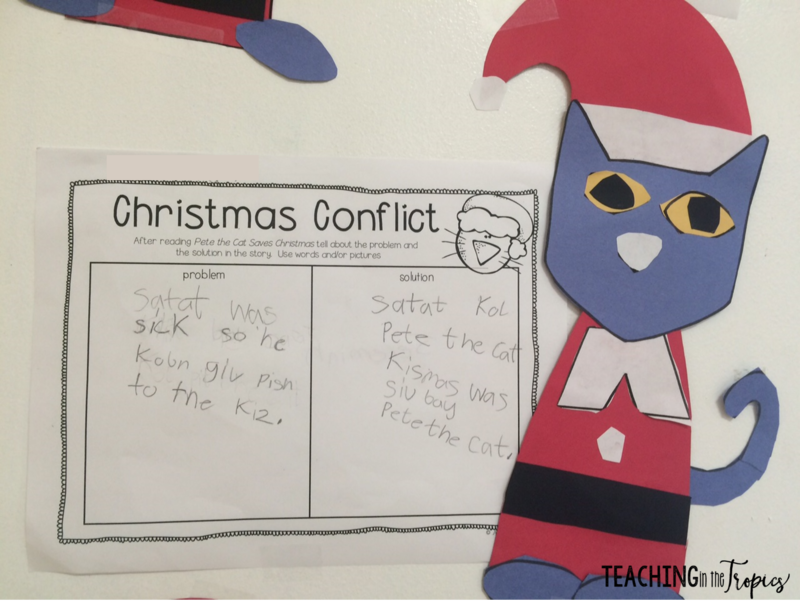 How do you incorporate kindness in your classroom for Christmas? Five for Friday: It's beginning to look a lot like Christmas! Happy December and happy Saturday! I can't believe how quickly time is passing! I feel like the first day of school was yesterday and yet, here we are in December. I'm linking up with Doodle Bugs Teaching for the first time in a long time to share what we've been up to this week. We recently learned about fact families in math, so this freebie from Oceans of First Grade Fun was the perfect activity to show off our learning! I do this craft with my class every year and it always looks so cute on display! The best part about it is that it really can work for just about any concept since the templates don't have any writing already on them. Last year I used it to review place value. We wrote a two digit number on the star and on the ornaments we wrote the number of tens and ones, and then wrote the expanded form in two different ways. The craft fun continued with Pete the Cat! 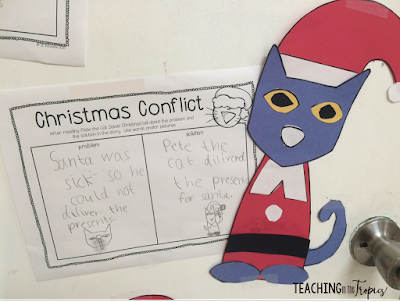 We read Pete the Cat Saves Christmas and I was shocked to find out that only a couple of my students had ever heard of Pete! He's definitely not as widely known here as he is in the U.S., but I have a feeling I've created some new fans. ;) After reading the story, we wrote about the problem and solution using this freebie and craft from School is a Happy Place. I seriously can't get over all of the amazing FREE Christmas activities available on blogs and TPT. So thankful for all the teachers out there who so generously share their creativity with us. I've actually started a Pinterest board full of free Christmas activities and ideas for K-2, so check it out if you're in need of ideas! Here are some close ups from a few of my kiddos. This little sweetie has made so much progress in writing since the beginning of the year. I am so proud of him! 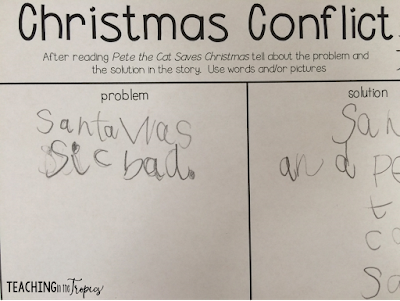 Problem: "Santa was sick so he couldn't give presents to the kids." 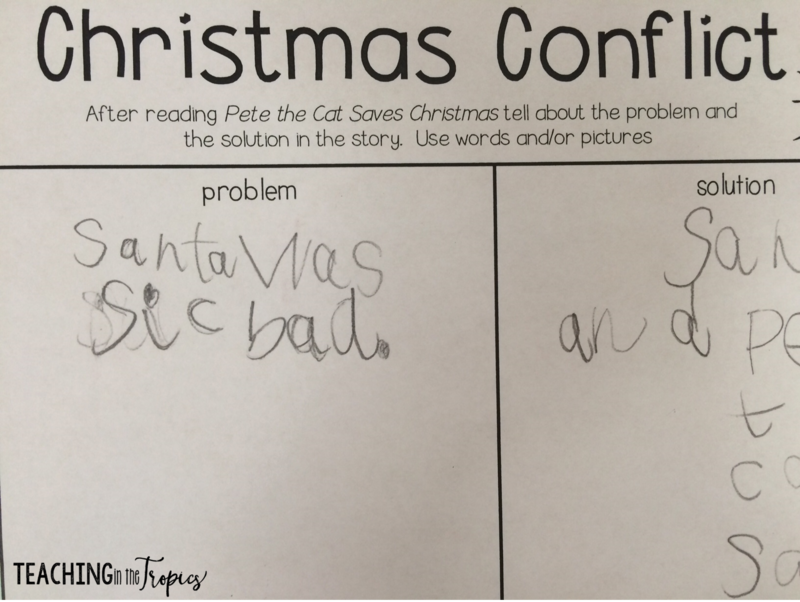 Solution: "Santa called Pete the Cat. Christmas was saved by Pete the Cat." Can you tell this student loves to draw? Love the illustrations he added to match his sentences! This is another student's writing and I just had to share it! This response cracked me up because this is how people here talk. People oftentimes use the word "bad" as a replacement for "really," so instead of saying that someone is "really sick," a lot of Caymanians would say that they're "sick bad." I could almost hear this student saying that as I read it to myself so it brought a big smile to my face. 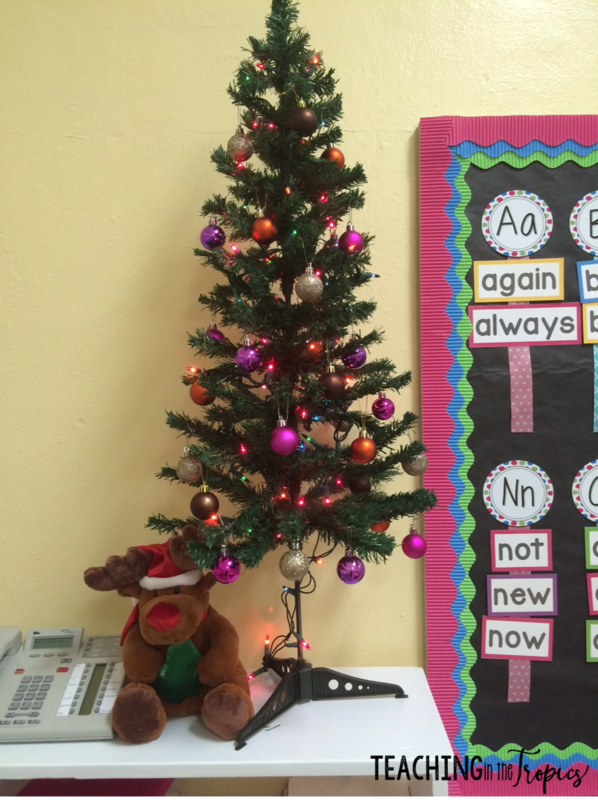 I put this Christmas tree up in my classroom on Monday after my kids left. They were so excited to see it when they came in on Tuesday and it helped them to realize that we were finally in December and counting down to Christmas. Rudy the Reindeer is also helping to add some motivation in our classroom during these last few weeks of school. Each day, my students have the opportunity to earn the right to have Rudy at their table for a day. Each morning, I put him in the middle of the table of students who had the best behavior the day before. The kids at the table get to pet Rudy, but can't pick him up or move him from their table during the day. I tell them he's there to watch them work. ;) They know that if they let it become a distraction, I'll remove him and he'll go to a different table. It has really been working well so far! It's crazy how motivating a stuffed animal can be to kids and the excitement on their faces when they earn Rudy for the day is too adorable. What tricks do you use to spice up your behavior management for the holidays? Christmas came early today when I finally got the new printer I ordered. I'm so excited to own a laser printer! Did I mention it also prints in color? 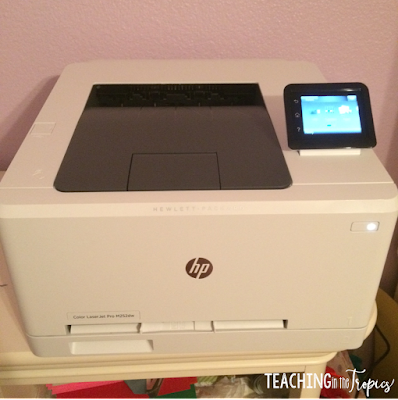 It is an HP LaserJet Pro M252dw and I got it for less than half of its original price on Amazon! The price has gone up a bit since I purchased it, but it is still an awesome deal! Click here to check it out! 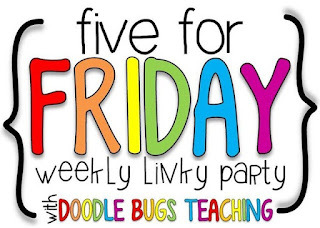 Be sure to head back to Doodle Bugs Teaching to read some other Five for Friday recaps! I'll be back next week with an update on the Christmas fun in our classroom! 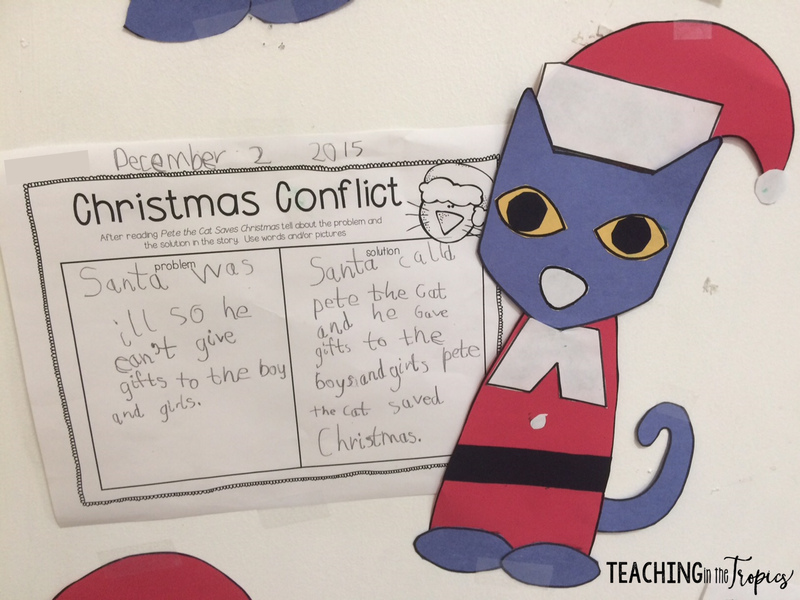 Do you have a favorite Christmas activity or craft that you do with your class?